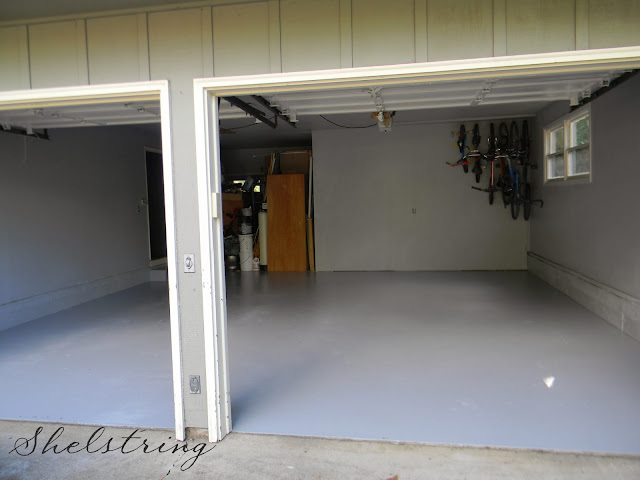 If you've been with me throughout this 31 days of completion series, then you know what a task it has been (to put it mildly) to finish our garage floor. After weeks of serious roadblocks and tears, I am happy to say that the project of finishing the garage floor is complete! A 5 gallon bucket, hard bristled broom, rubber gloves, scrub brush (for edges and hard to reach surfaces), old measuring cup, hose, muriatic acid. And the most important, but not pictured, is a pressure washer. This became my best friend and enemy, after 4 days time. First, mix the acid and water, filling the bucket with water first, and then adding acid. Pour in sections, one at a time, and scrub in with hard bristled broom. Do this until the entire floor is covered. It will fizz when applied at first. After letting the last bit set for around 10 min., spray with a hose. Next, pressure wash entire floor until thoroughly rinsed. Let dry over night and check floor. If there is a chalky residue, pressure wash again. Repeat until no chalky film is left on the floor. There must be a good 24-48 hour dry time before applying epoxy. For this project, I used a two part, oil based epoxy that requires 2 applications. This isn't common, the common epoxy out there is water based. The kind I used is recommended by professionals who have had experience scraping off old epoxy that has begun to peel over time from the surface. This epoxy is used in marinas, so you know it is durable. After what I went through in prepping the floor, there was no way I was going to repeat the whole scenario again. Mix the epoxy with a mixer attached to a drill. Pour in part A before part B. You will hear and smell and see a chemical reaction. It is strong since it is oil base, and the epoxy is nice and thick. Let sit for 30 min. While I was waiting, I swept the floor again to ensure all the surface was free of any dust or small grained dirt. The first thing I did was paint the outside edges with a disposable, real hair brush. This is important. DO NOT use a synthetic bristled brush! I bought two brushes for each application to enlist help. If possible, this step is so much more endurable and enjoyable with the help of somebody else. It was a nice time to visit with my cute boys. One helped me the first time, then the other the second time. This epoxy can be any color you would like, just note that when you pick a color, you will end up with it a shade or so lighter. The first time I painted, it was lighter than I had wanted. After brushing the epoxy on, I rolled it on with a roller with a 1/4" nap, this wasn't a roller cover I'm used to using and was a tad bit more expensive since it can endure the chemicals of the epoxy. When preparing for this project, ask a knowledegable salesman. I was working with the men at Sherwin Williams that were really familiar with the product. I also used an extention handle to roll with. This made the job actually enjoyable. Also, as you are painting, to avoid roller lines, flip the roller over after rolling a couple times. This will help smooth out any lines caused by the pressure of the roller. The first time around, I ran out of epoxy at the end. This was because we did the walls that extend up the sides of the garage. The second time around, we did not paint these since we figure they won't be getting the same kind of use as the rest of the floor. The advantage to having to paint a second coat, was that I was able to pick a darker shade. This was nice too, since I could tell where I had already painted or missed during application. Here I am in all my painter's glory. I'm actually smiling since I'm at the end of the project. The light at the end of the ongoing, trammatic tunnel. And I'm finally done! WOO HOO!! Let dry completely, this time can vary dependent on temperature and humidity. Wait a good two days before putting anything on it. Let cure without motor vehicles for a good two weeks. I haven't wanted to put anything on it that wasn't cleaned real good first. I dare say it's the cleanest part of our house right now. Sorry, but true. Where has all my attention been, after all? This project is what inspired my 31 days of completion theme. Projects can become so overwhelming that you just want to quit. We need to remember that the things in this world are here for us to find joy and love and happiness in the process of the use of them. That is what I learned from this project as I enlisted the help of my wonderful children. 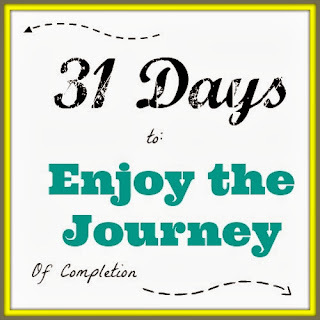 Enjoy the journey of completing what you start. Often times, what you do and learn in the process is the most important part in the end. A big Woo Hoo for you!!! It looks awesome!! It feels good to complete something that has been sitting out there incomplete, haunting, taunting, and harrassing you by it's unfinished presence. Okay so that is how I felt anyway. Your floor looks so good and I don't blame you, I wouldn't allow anything that wasn't already clean on that floor either! Woo Hoo for you!! Spending time with those precious young ones was an added bonus! What fun that must have been!! That floor looks great! I can imagine that was all quite the task...it looks like it was totally worth it though! It DOES look amazing!! Great job! Thanks for stopping by!